You will want to try this easy and delicious creamy Rumchata fruit dip! Have you tried RumChata? It is a cream liquor made of a blend of rum, cream, cinnamon, vanilla and other secret ingredients. It is delicious. 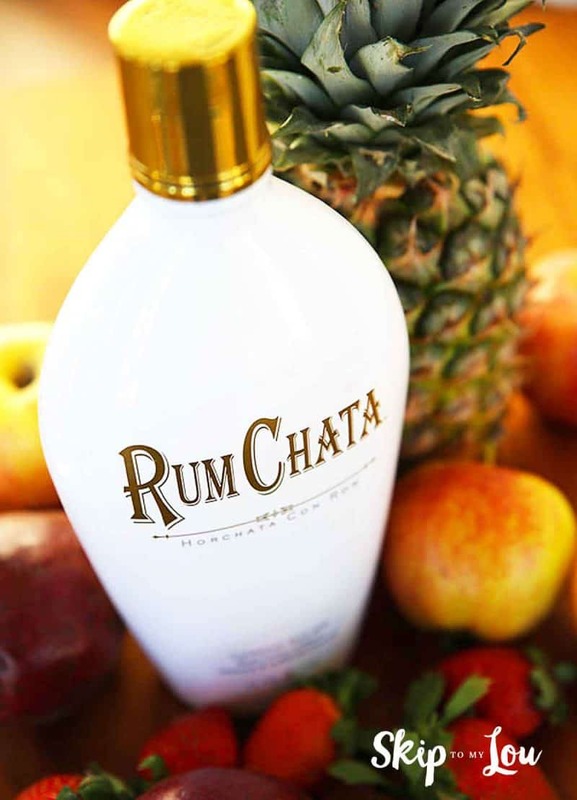 I was thinking the flavors of RumChata would be perfect for fruit! You might also like RumChata in your coffee. I do! 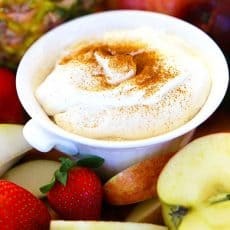 Made with cream cheese, brown sugar this rich and creamy dip is perfect to serve with fresh fruit. Simple ingredients blend together to make this fruit dip. I love serving things like this for baby showers and gatherings with friends. You can also make a fluffy fruit dip with Marshmallow cream like this marshmallow cream cheese dip. If you are looking for some other dip recipes don’t miss my chocolate chip cheesecake dip and I promise you won’t be able to stop eating this monster cookie dip. It pretty amazing too! Rumchata is a cream liquor made of a blend of rum, cream, cinnamon, vanilla and other secret ingredients. With an electric mixer beat together cream cheese, RumChata, and brown sugar until smooth and creamy. 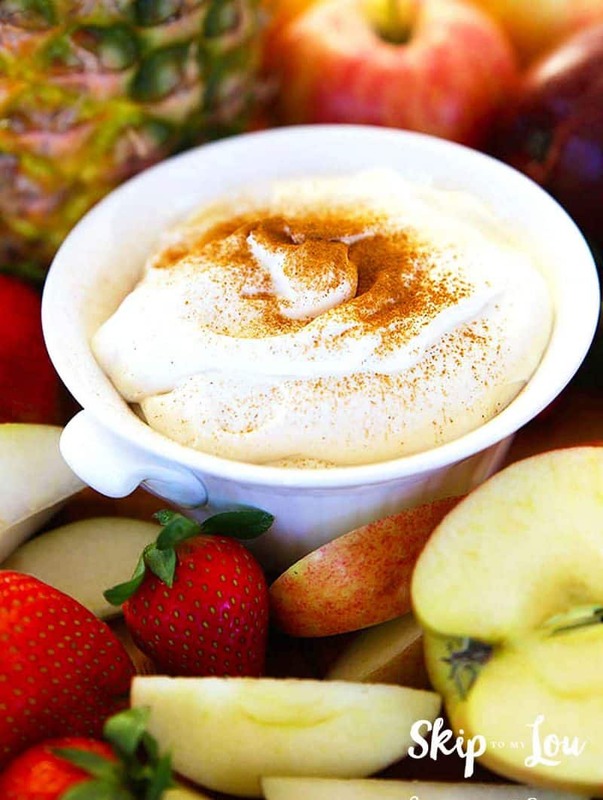 Sprinkle cinnamon on top of the dip and serve with fresh fruit. Looking for something alcohol-free? Try this apple dip. This cream liquor sounds yummy in RumChata bread pudding and RumChata Tres Leches Cake. 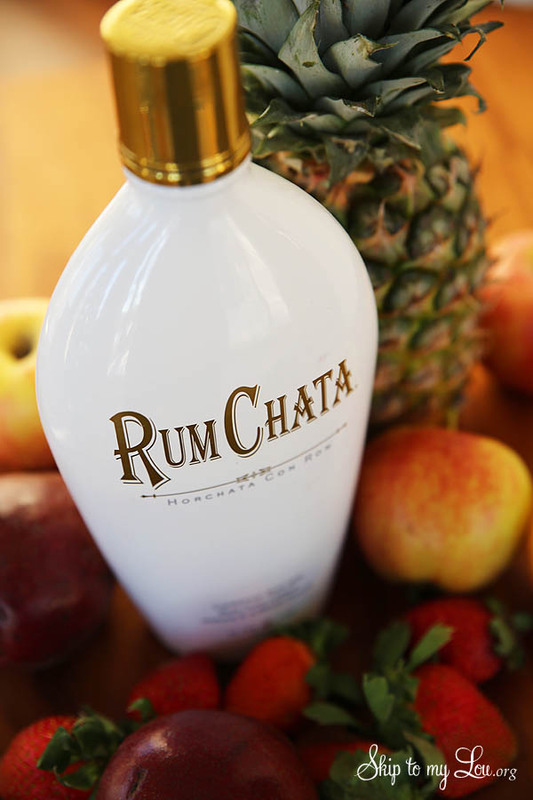 What would you make with RumChata? First, though give this easy fruit dip a try. I think you will love it! How do you keep sliced fruit from turning brown? Keep sliced fruit pretty by soaking the fruit for about five minutes in a solution of lemon juice. Mix 1 tablespoon of lemon juice per 1 cup of water. You can also use other citrus juices like pineapple, or orange. If you are worried about the slight lemon flavor soda water or club soda also works great! No mixing required, soak the fruit for about five minutes. Would this be good served with cinnamon Graham crackers and nilla wafers? hello. last month you posted a recipe for RumChata fruit dip.. Was wondering if the dip can be prepared a day in advance, and stored in a tight container. Yes! Becky I have made the dip the day before.